Recent release “The Christian Family: A Biblical Perspective” from Page Publishing author E. G. Sherman Jr. is a Bible based analysis of a monogamous marriage with at least one child, and proves to be a valuable resource for family life and child rearing. 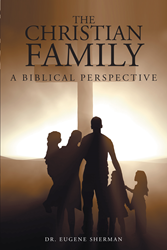 E. G. Sherman Jr., PhD., DST, DA, a Purdue trained sociologist, has completed his new book “The Christian Family: A Biblical Perspective”: an intriguing and relevant teaching resource for families and clergy alike as it is firmly anchored in biblical teachings. Published by New York City-based Page Publishing, E. G. Sherman Jr., PhD., DST, DA’s beneficial and useful book is an excellent tool for home study, both with the total family gathers of within an individual reading. Readers who wish to experience this inspiring work can purchase “The Christian Family: A Biblical Perspective” at bookstores everywhere, or online at the Apple iTunes store, Amazon, Google Play or Barnes and Noble.